Jeff Smith and Jeffrey Smith are both great illustrators. There are at least 2 great illustrators named Jeff Smith. One is a Pennsylvania-born cartoonist who moved to Ohio and started cartooning for the Ohio State Lantern. 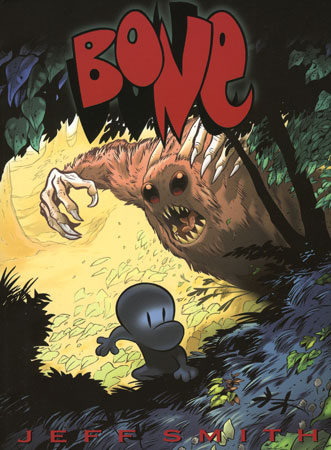 In 1991, Smith self-published a small black and white comic book called Bone. Bone went platinum, with such a fanatic following that it was picked up by major publishers, and has since sold millions of copies. I know the other Jeff Smith. By the way, Columbus, Ohio is fertile ground for cartoonists. The brick Victorian home of James Thurber, the New Yorker cartoonist best known for his short stories, is worth a visit. Milt Caniff, who drew the aviation adventure strip Steve Canyon lived in Columbus. Caniff’s original artwork, along with that of many others, is housed at the Billy Ireland Cartoon Library and Museum on Ohio State’s campus. Years ago, I visited the Cartoon Library and Museum. I was told there was no public exhibition at that time and the collection was only open to comics scholars. I said I was scholar with a specialization in screwball comics. (If you are ever challenged about your comic scholarship, this response works wonders. I was a college dropout at the time.) The librarian gave me a pair of white gloves and opened up a flat file. 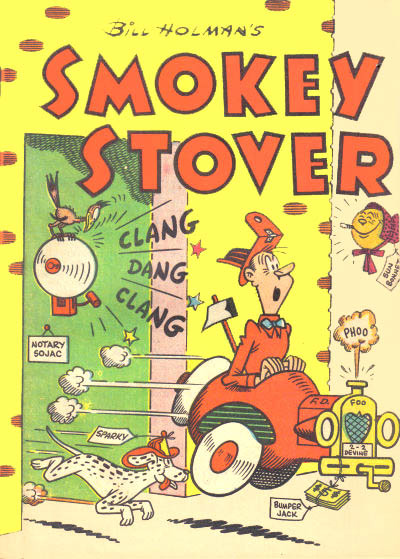 I was permitted to hold original art from Bill Holman’s Smokey Stover. It was just india ink on bristol board, but Wowie-Zowie, the ink was in all the right places. I was in screwball scholarship heaven. Clang! Dang! Clang! I digress. 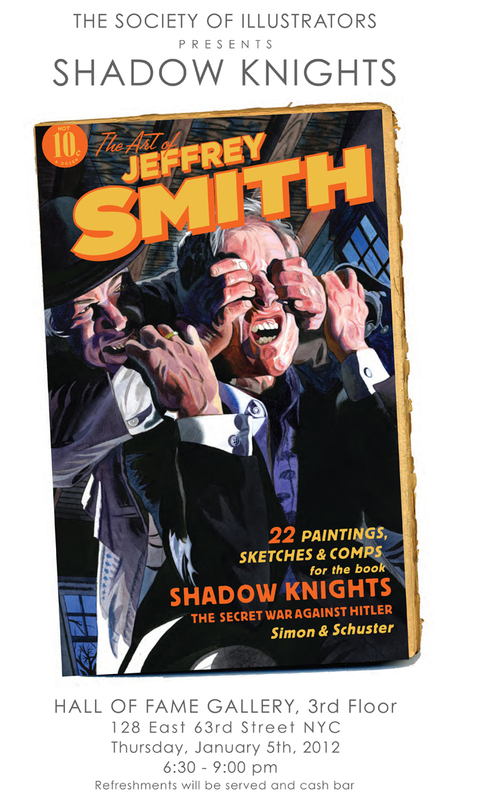 The other Jeffrey Smith is a friend of mine. Here is an invitation from the Society of Illustrators to see his work. Go ahead. Click on it. You are invited, too. January 5, 2012. I know, it costs $20, but this is your chance to get into the exclusive Members’ Hall of Fame and the Society of Illustrators lays out a nice spread. 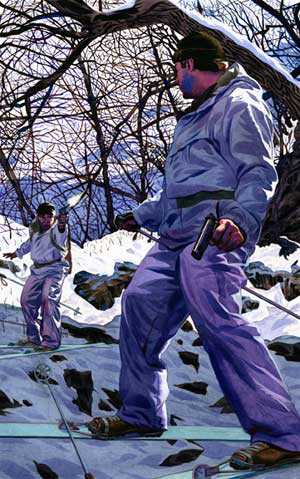 Smith is illustrator of Shadow Nights: The Secret War Against Hitler. He will discuss the project including his research trip to Paris to visit the places where Churchill’s Special Ops Unit fought their secret war against the Nazis. Shadow Nights is part of a new series called Pulp History from Simon and Schuster, which looks to be a fascinating mix of history and edgy graphics. There is another volume, Devil Dog, illustrated by legendary underground cartoonist Spain Rodriguez. This other Jeff (as I call him) Smith and I were classmates at the School of Visual Arts. He teaches at Art Center of Design in Pasadena. He studied with illustrators Phil Hayes and James McMullan, both outstanding watercolorists. The work he has done for Pulp History shows their influences. Stylistically, this new work also reminds me of my old thesis advisor, Julian Allen. Jeff’s illustrations have appeared in Rolling Stone, Newsweek, and G.Q. He deserves his success. I hope to make it into the big city next week to celebrate his Shadow Knights exhibition. Speaking of Columbus, Ohio: “Comics destroyer” Paul Pope (THB, Heavy Liquid, 100%), who is also a friend of Jeff Smith, spent time in Columbus early in his career.